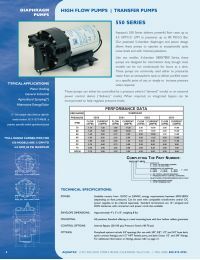 The Aquatec 550 Series Pumps are used to either draw water from a holding tank and pressurize it, or boost pressure from a low pressure source. Although designed to operate intermittently, many 550 versions can run continuously for several hours at a time. 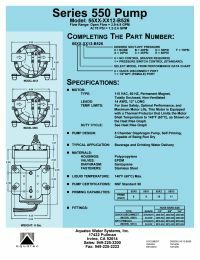 These pumps can be operated either in demand mode (pressure switch controlled) or in delivery mode (controlled by external power switching device). If needed, an integral bypass can be used to limit pressure.